Dahlia Season...It's here and the flowers are as big and beautiful as last year. Here's the start of dahlia portraits. Two very different dahlias with different treatments. The first is like an exquisite wedding dress. Each petal in the centre is folded like some expensive silk handkerchief. 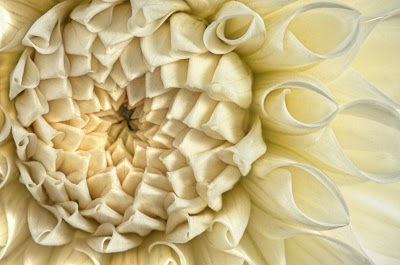 As the petals mature, these folds disappear into gorgeous curls that open up into beautiful spirally tubes. I chose a colour treatment that would make this white dahlia look like an antique white silk. 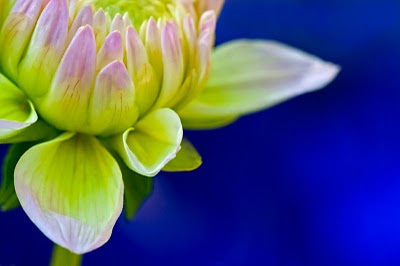 This second portrait pays homage to water lily dahlias. I haven't been able to shoot my own water lilies, as the racoons buzz the top of the flower petals each time one comes close to blooming, and it's not nice enough for a traditional floral portrait, nor funky enough for something on the pop art side. So here's my water lily portrait, with a deep blue ocean in the background to this lovely pink and green water lily dahlia.